1. Orange peel baby quilt! Here's a sneak peek. This has a deadline of August 1 so it's urgent. And way too much fun. Don't forget, I'll be explaining my method on Monday! 2. Sister's Ten BOM quilt. This has been a goal since December... *blush*. I've finally started to get through my stack of WIPs and this one is nearing its turn. 'Nuff said. Okay, I should give myself some credit - I did finish the top in April. 4. Finish the progressive quilt! I want to enter it into the QuiltCon collaborative category, so it needs to be basted, quilted, and bound this summer. I am so excited to work on this one - I just ordered Medium Purple Aurifil Thread from my sponsor, Hawthorne Threads! 5. 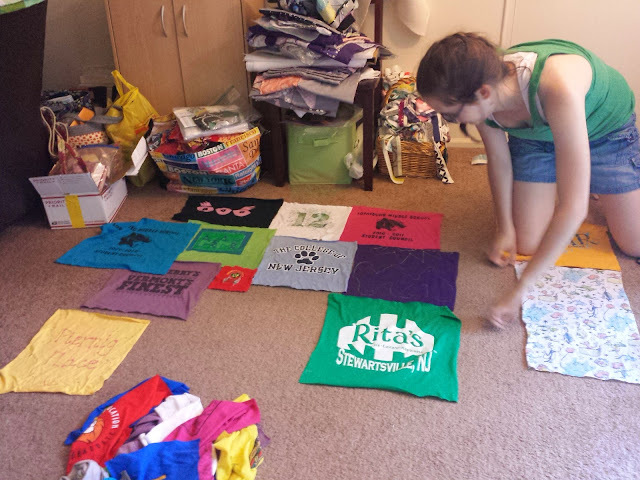 Finish my sister's t-shirt quilt. The top is done (she helped me put it together!) and all the rest is bought - just not started. I have needles for the stretch fabrics all ready to go. 6. This one is a long shot, but I want to start and finish a wall-hanging for my sister-in-law and her family. They requested it last winter (I wanted to make them something and they chose this) and I really am looking forward to cutting into my FQ bundle of Sunnyside. I'm going to use the Lighthouse pattern by Fresh Lemon Quilts and Kona White as the background. I also have to start paper-piecing - hopefully I can conquer both that and garment sewing this quarter! There are bound to be a few new projects in there as usual. I'm not ready to put the medallion on here though, lol. But, I'll be back tomorrow with a finish for the week! Thanks for Katy of The Littlest Thistle for the extra push to get these done. I'm linking up over there! What a pretty list! And hurray for purple thread! I have the Washi pattern and finally got some tracing paper, so I pretty much have no excuse (except finding some time) to make it now. I can't wait to see your dress and fabric choice! 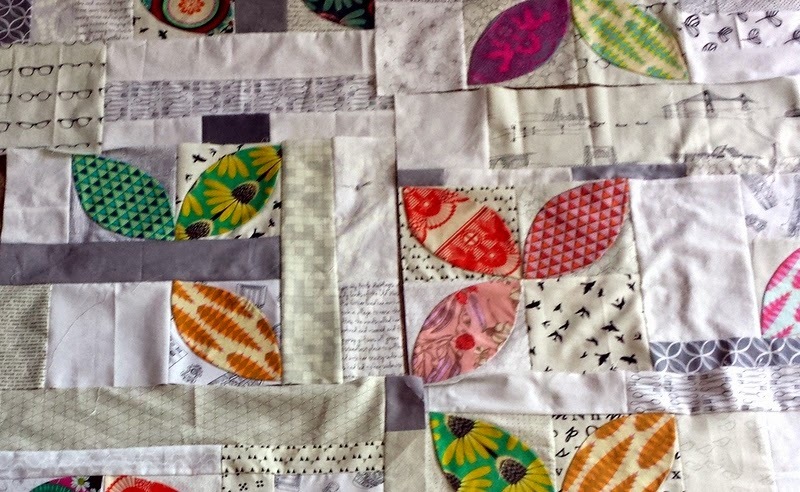 You can totally do paper piecing!!! Garment sewing is on my list too, so I'm less confident there.... Regardless you're going to have an awesome summer/quarter filled with beautiful fabric! You did great last quarter, so keep going at it. 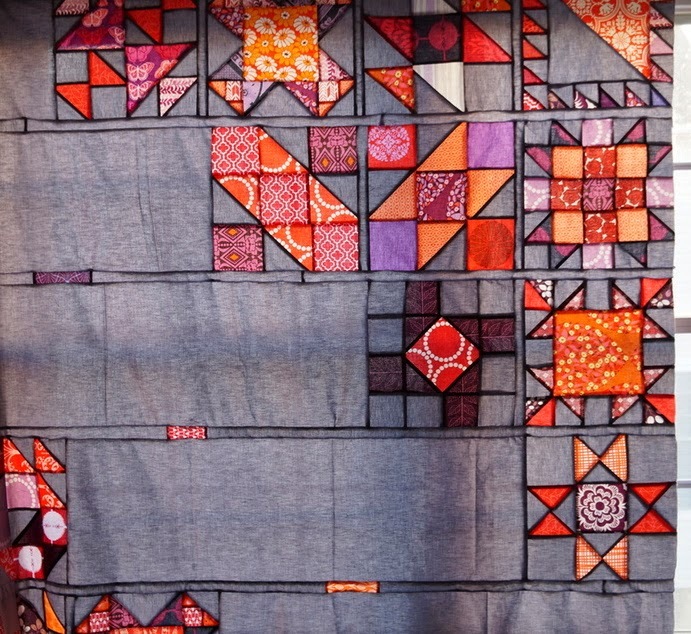 Paper piecing is hard for the first couple of blocks, and then totally makes sense. 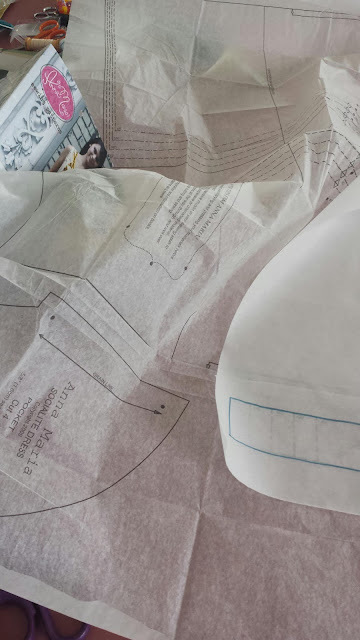 I like to use templates for irregularly shaped pieces, it really helps.